Our Deluxe Razor X cutter's can slice thru stiff material like cork board or thin foam, bubble, paper, chipboard and singleface corrugated. These cutters have titanium blades that stay sharper longer than standard blades. The Razor X cutter's track has been designed to stay clean much longer as material doesn't pull up on the track and material won't clog up the track. The cutting height guard is adjustable for a thickness of 3/8" to 5/8". This feature makes changing cutting blades quicker and easier; allows you to remove the lower portion of the head instead of taking the steel tube off the track. Our Deluxe cutters all ship UPS direct from the factory. Cuts material up to 1/2" thick AND 24" WIDE. Will cut stiff materials like cork board. 4-notch titanium edged utility blades are standard with all Deluxe Cutters. 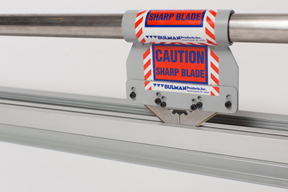 Titanium blades stay sharper longer than standard blades. Our Deluxe Razor X cutter's track has been designed to stay clean much longer as material doesn't pull up on to the track and material doesn't get clogged up on the track. The cutting height guard is adjustable for a thickness of 3/8" to 5/8". This feature makes changing cutting blades quicker and easier; allows you to remove the lower portion of the head instead of taking the steel tube off the track. Cuts material up to 1/2" thick AND 36" WIDE. Will cut stiff materials like cork board. 4-notch titanium edged utility blades are standard with all Deluxe Cutters. ASSEMBLY TO ORDER, ALLOW 5-7 DAYS TO SHIP. Cuts material up to 1/2" thick AND 24" WIDE. Will cut stiff materials like cork board. Cuts material up to 1/2" thick AND 48" WIDE. Will cut stiff materials like cork board. Cuts material up to 1/2" thick AND 60" WIDE. Will cut stiff materials like cork board.